The Heritage Education Centre at Mont De Lancey has been established for over 10 years. Run in conjunction with Mont De Lancey staff and Wandin Yallock Primary School staff and students, our activities are designed to cater for the very young to senior school students. 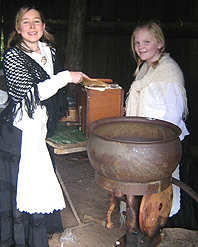 The Heritage Education Centre explores the lifestyles of late 19th century to early 20th century Wandin settlers. Guided tours of our facilities and hands on experiences of settler activities for all students ensure a rich understanding of this unique time in our history. Whether it is ‘being disciplined’ in our old school house, learning to write with ‘pen and nib’ & inkwells, playing quoits, making peg dolls & lavender bags, cooking damper, making butter, or watching the blacksmith at work, students are always engaged and eager to participate. We cater for group bookings from 45 to 70 on a daily basis (normally Tuesdays & Thursdays unless other arrangements) and are able to tailor a program especially for the needs of your students. The Heritage Education Centre is open to schools from Wednesday to Friday.